Rock solid, the world’s leading female defensive player, Wu Yang paved the way for Falcons to win India’s inaugural CEAT Ultimate Table Tennis. Staged in Mumbai, on Saturday 29th July she remained unbeaten as a 14-5 win was posted against DHFL Maharashtra United; the following day it was just the same, a 14-9 margin of victory was the outcome in opposition to Shazé Challengers. The results meant that she ended matters as the whole events leading player. Comprehensive successes were the order of proceedings on each visit to the table, four matches played, four straight games win. Against DHFL Maharashtra United, she beat Pooja Sahasrabudhe (11-2, 11-4, 11-2), before accounting for Liu Jia (11-5, 11-5, 11-6). Impressive on the penultimate day of action, it was the same on the concluding day when facing Shazé Challengers. Imposingly, she beat Mouma Das (11-6, 11-2, 11-3) and Han Ying (11-10, 11-4, 11-8). Wu Yang the mainstay of success but one player does not make a team. There was major support from Liam Pitchford. In opposition to DHFL Maharashtra United he overcame Wong Chun Ting (11-9, 9-11, 11-4) and Harmeet Desai (11-6, 12-10, 11-7). The following day he experienced defeat at the hands of Andrej Gacina but did secure a vital game (11-3, 10-11, 11-7), prior to beating Soumyajit Ghosh (5-11, 12-10, 11-7). Vital roles from Wu Yang and Liam Pitchford but the player to secure the title was Pär Gerell. He faced Li Ping in the eighth match of the fixture with Falcons leading 13-8, he lost the first game but then recovered to win the next (5-11, 11-9); the magical 14 points had been reached. The previous day at the semi-final stage, Shazé Challengers had beaten Dabang Smashers 14-9; the mainstay of the victory being Han Ying. She had accounted for Madhurika Patkar (11-4, 11-6, 11-7), and Kim Song I (6-11, 11-9, 12-10). 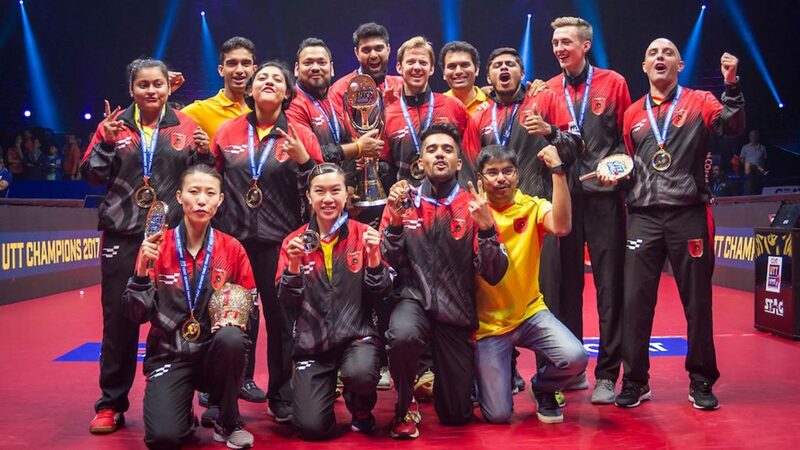 A new initiative completed; alongside Wu Yang, Liam Pitchford, Sanil Shetty and Pär Gerell; it was celebration time for their team mates Lee Ho Ching and Sutirtha Mukherjee. The mission had been completed, the title belonged to Falcons.